This verse is often quoted and, by itself, has a pretty straightforward message—we are to . But the larger passage from which this verse is taken (Matt 25: 31-46) speaks about Jesus’ Second Coming and the criteria that will be used to open up the entry door to His Eternal Kingdom. So, there’s a lot more going on than just a nice sentiment. It warrants a closer look. The phrase “the least of these” is one we should consider with great care. We must understand that “the least” is a standard applied by our broken world that counts “the least” as the losers while it proclaims others as winners. This is not God’s standard. Reaching down with a helping hand is much different than reaching out with a helping hand. “Reaching down” implies, intentional or not, that we are of a higher position and those we help are of a lower status. Don’t fall into this trap! In comparison to God, we all fall so dreadfully short of His glory that each of us is to be counted among the ranks of the “least of these” along with every single other human being. Since we are all helpless “leasts,” saved only by accepting His free gift of grace through faith in Jesus, we should be about spreading the message of that infinite gift to all of the “co-leasts” around us. When you buy a new car, it is perfect. The outside finish has the new car sparkle and shine, the inside has the new car smell. There is one (and only one) way to preserve the car in this pristine condition. Park it in a climate-controlled garage, drape a protective tarp over it, and never drive it. Now if you’ve just purchased a cherry, all-original, ’57 Chevy Bel Air convertible you might do exactly this. But most often, cars are bought to be driven. This subjects them to the dings in the door, pebbles kicked up into the windshield, and the infamous double-dip cone becoming a single-dip cone in the back seat. When a new ship is commissioned, it is perfect. It’s hull is perfectly smooth, the deck has an unblemished coat of non-slip epoxy, and the bridge has that new-bridge smell (whatever that smells like). If the captain’s highest aim was to preserve his ship he would keep it in port. He might take the additional precaution of keeping it in dry dock and not even putting it in the water. While maintaining his ship is important, it is never the highest aim of the captain to keep it pristine. The captain is to set sail to assigned ports of call, to deliver cargo or passengers to their destinations. Thus, the ship will soon loose its new-ship sheen, the shine will dull, the hull may be damaged, barnacles may jump on for the ride. Bartering with God. If we all are truly honest, we will remember times when we’ve done this. It usually happens in times of trial or struggle. If God will just get us out of this mess we’re in, we’ll vow to straighten up and never get ourselves into the same mess again. 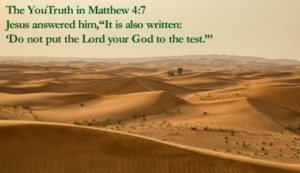 Jesus led us by His powerful example with regard to testing God. Jesus was facing a battle greater than many we will ever face. After 40 days in the wilderness with nothing to eat, Satan shows up, with his remedy to Jesus’ hunger—he tells Jesus to use His superpowers! Then Satan ups the ante two more times with more temptations all designed to get Jesus to betray God. Jesus, of course, stands firm and does not give in to Satan’s plan. Putting God to the test, is part of Satan’s plan for us too. He tells us to withhold praise until God does what we want. He tells us that God is a god of “if you scratch my back, I’ll scratch yours.” He tells us to test God’s promises by demanding that they be delivered on our terms instead of God’s. The main flaw in Satan’s plan is that we don’t have anything to offer God. God doesn’t need anything. He’s God. So, the whole testing and bartering thing doesn’t work. And think about this: God’s gift of grace is the gift of His infinite love for us. First, it is of infinite value, therefore there is nothing of finite value we could barter for it. Second, God’s grace is a gift. There is nothing we need to barter for it. So when you face temptations, particularly those associated with tough times, don’t test God, just trust Him. Sometimes the promises of God bump up against circumstances or conditions that seem to erase them or render them unkept. In these cases, one of two things has happened – we have understood God’s promise within the limits of this world or we have understood God Himself within the limits of this world. In both cases we are mistaken and this causes us to miss out on so much God has for us. When He was crucified, they thought He was gone. They were a scared, dejected, scattered lot. And then He rose from the dead. He was back! They worshipped Him and He taught them many things. Soon after He told His disciples that He would always be with them, He left again! (see Acts 1:9) Following the coming of the Messiah was a bit of a roller coaster ride. Let’s go back through the ups and downs to get us ready to discuss our passage. Just as the prophets foretold, the Messiah, Jesus, was born in Bethlehem. Angels announced His birth, and the news spread that the Messiah had come. Mary and Joseph took Jesus and fled to Egypt to escape the danger of King Herod’s jealous wrath. They remained in hiding until Herod died and eventually made their way to Nazareth where Jesus grew up in obscurity in Galilee. In just a few short days, Jesus was flogged and executed on a wooden cross as a criminal. The roller coaster hits the lowest of lows. Three days after being buried in a rock tomb, His followers discovered that He had risen! He was alive! It was during this period that Jesus delivered the promise that is in our passage – He would always be with them. The disciples must have thought, ‘Finally, the roller coaster ride is over.’ But, alas, it was not. Soon after Jesus made His promise. . .
Jesus was giving His disciples important instructions when all of a sudden He rose up into the sky and disappeared into a cloud. They were stunned! They just stood there, looking up, not knowing what to do or say. I’d forgive them if they were a little confused. Jesus took His place at the right hand of God in heaven and seemingly reneged on His promise to always be with them. Jesus’ last instruction to His disciples holds the key to understanding how He was going to keep His promise. He told them to stay in Jerusalem until God sent what He had promised – the Holy Spirit. The chemical compound H2O can exist in three unique forms – solid as ice, liquid as water, and gas as water vapor. Each is fully and completely H2O yet each has its own unique characteristics. So it is with the three persons of God. Each is fully and completely God, yet each is unique in their own right – God the Father and Creator, God the Son and Redeemer, God the Holy Spirit and Helper. So how did Jesus fulfill His promise to ‘be with you always?’ while also residing in heaven at the right hand of God? He sent His other person – the Holy Spirit. Now back on the roller coaster. . . When Jesus is with us, He is within us. 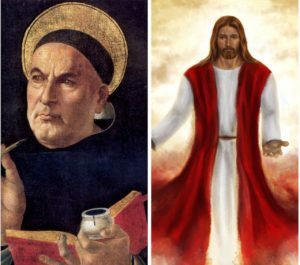 The very person that has the power to create the universe, overcome the grave, and teach us the truth is the same person that resides within us when we make Him our Savior and Lord. You see, Jesus is more than just an almighty bodyguard that walks with each of us, He is the very person that walks in each of us. The apostle Paul put it perfectly when he wrote, “. . . I no longer live, but Christ lives in me.” (Galatians 2:20 NIV) Jesus can never be separated from us because He resides within. It doesn’t get any better than that! So what are we to do with this Good News? 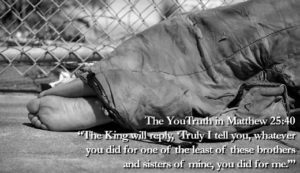 Jesus tells us in this passage – tell others about Him! Make disciples, baptize, and teach. It’s hard work but Jesus knows we can do it – after all, He is within each of us! That’s the truth. That’s the YouTruth – Jesus Is With You Always. The world, in a state of uniform motion away from God, tends to remain in that state of motion unless an external force is applied to it. Jesus used two examples to illustrate how this spiritual law works—salt and light. The proper use of these items is akin to applying an external force, influencing and changing that to which it is applied. In order to change darkness into ‘lightness’, a force that is fundamentally different must be applied. Simply put, light is the opposite of darkness and therefore qualifies, but when covered by a bushel basket, would lose its differentiating quality from darkness and would thus have no effect on it. Unencumbered light, as with the lights of a city upon a hill on a dark night, makes such a difference that it can be seen for miles. For every godly action, there is an opposite worldly reaction. Many will wrongly expect the world to receive our testimony with open arms, willing acceptance, and maybe even applause and accolades. While some will embrace the message, there will always be those who don’t. You see, the world likes the direction it is going. A life of material self-focus is very comfortable and fully acceptable to those who don’t know that God has something far greater for them. And the world will fight to protect these comfortably ways. When we follow Jesus, the world will press against us. There will be opposition at every turn. This opposition will often be unpleasant and sometimes downright nasty. People will mock us. People will tell lies about us. We will face persecution. When this happens, Jesus says to receive it with joy! Why? Because the 2nd Law instructs that we are not on the right path, we are not heading in the right direction, we are not following Jesus if we are not facing these consequences. If we are not facing opposition, we are not on the path to the great reward Jesus promises! It is Jesus’ great reward, and only Jesus’ great reward, that can bring us true joy. 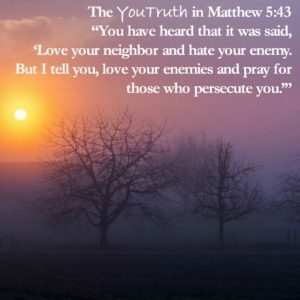 As it turns out, mockery, lies, and persecution are exactly the assurance we are looking for. And the world unwittingly provides it. Jesus was no passive teacher on this point. (see Hebrews 12:1-3) He led by example. He died a shameful, agonizing death on the cross because of the joy He knew would be His for having done so. There are many other examples of faithful people that faced worldly opposition too. Prophets, apostles, and countless others who were simple, average folks like us, were beaten, ostracized, even killed. These predecessors form a ‘great cloud of witnesses’ that surround us everywhere, every minute of every day, especially when we are facing opposition ourselves. They remind us of the joy of the prize and to not lose hope or grow weary (see Hebrews 11:1 – 12:1). That’s the truth. You are the salt of the earth. So you are called to be salty! You are the light of the world. So you are called to let your light shine! You are called to be the external force that turns the direction of the world around. You will face opposition. When you do, receive it with all joy! It is the assurance that you are on the road to great reward in heaven! That’s the YouTruth – You Are the Salt and Light.